For the first time in years, I'm using a Windows PC as my main computer. It's Windows 8.1 and thanks to a great introduction video the transition was quite nice. Of course there are things that I miss and keep doing wrong (right-click... had forgot all about that one), but overall I'm happy. The first main thing that I ran into was when I was planning on sharing my internet connection so that my phone could use it. Nothing strange really. I do that several times a day on my MacBook Pro. And it's dead-simple too. Click the Network-symbol and go "Create network...", give it a name (and optional password) and you're done. For the first time in years, I'm using a Windows PC as my main computer. It's Windows 8.1 and thanks to a great introduction video the transition was quite nice. Of course there are things that I miss and keep doing wrong (right-click... had forgot all about that one), but overall I'm happy. The first main thing that I ran into was when I was planning on sharing my internet connection so that my phone could use it. Nothing strange really. I do that several times a day on my MacBook Pro. And it's dead-simple too. Click the Network-symbol and go "Create network...", give it a name (and optional password) and you're done. So you can imagine that I was surprised when I started to search for this in Windows 8.1. It was guides on how to use DOS-commands and other configuration. Or stuff that I should download and install (and that ended up crashing on me anyway). After a few hair pulls and, yes I admit, some screaming, I got around to a solution that at least works. Even though it's not simple. I wouldn't let my mom do this. And she could probably set up an shared connection on a Mac Book. There's a post that describe this approach in great detail and much better than me, so this is the short version + my gotchas. First, create a .bat-file with the following content. This will create the hosted network (or hotspot if you want). The big gotcha here is that you need to run this under Administrative privileges. But that's easy now that you have a .bat-file. Right-click it and pick "Run as Administrator". Well, that was not so hard, you think to yourself. And so did I. But now we actually need to let the hosted network use internet. Yes, I don't really know what it's is in this stage, but it doesn't have internet access. It's just another network adapter. Probably named "Network connection 24" or something. Open "Network and Sharing Center". This is easily done by a well-hidden gem of Windows 8.1. Go to the Start-screen and just start typing "Network and" and it will show up for you to select. Click the link to your network connection that has access to Internet. In my case the "Ethernet"-network. Yeah, sorry Mum. You wont pull that off. The only good news is that this configuration only needs to be done once. Once configured this will stay this way even if you shutdown the hosted network. As long as the network continues to get the same name ("Network connection 9" for example). The gotcha here was that the first time I did this the Internet access didn't show up for my hosted network for quite some time. Although it worked from my phone. It was some kind of refresh problem in the "Network and Sharing center" probably. Apparently some people have a few problems getting this far. 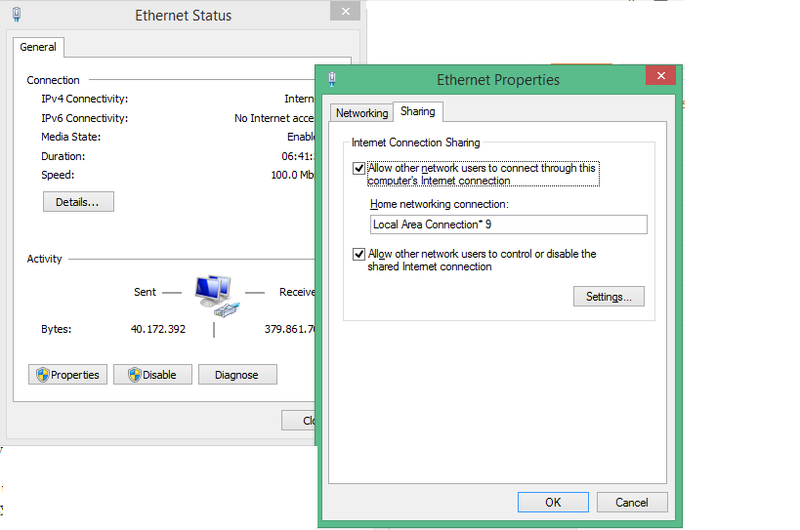 Thanks to Shirai I've got this tip; if your laptop cannot create the hotspot, open Network and Sharing Center -> change Adapter Setting -> right click on your Wifi Adapter -> Properties -> Advanced tab - > Click on Adhoc support... -> set value - Enable. This is a real hustle and shouldn't have to be this hard. The setup I have now works fine, but it took me about 2 hours to try to get it to work. I hope you don't have to spend the same amount of time. If anyone knows of a better, faster way of doing this: PLEASE let me know. I will happily delete this blog post.